With over ten years of international goalkeeping experience, involvement coaching elite goalkeepers for Capital Football in Wellington, New Zealand, national Cook Islands men’s soccer captain Tony Jamieson ran the goalkeeping course for coaches and goal keepers, aged 11-15. Football clubs around Rarotonga, Matavera FC, Tupapa Maraerenga FC, Takuvaine FC, Avatiu FC, NIkao Sokattak FC, Arorangi FC and Titikaveka FC have been invited to submit interested junior participants who may wish to take the role of goal keeping along with their coaches to see what is on offer from the experienced goalkeeping instructor. The program for the day included sessions on footwork, correct catching techniques, diving saves and positioning on the field, just to name a few. The focus of the workshops is to provide essential basic training on goal keeper skills to the participants in a fun way. “It is an opportunity for participants and their coaches to ask questions and to discover more about the technical aspects of the goal keeping role,” said Tony. 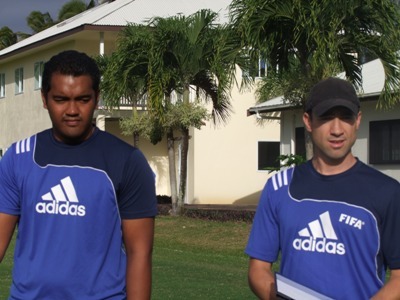 This workshop was the first of its kind to be conducted here on Rarotonga and Jamieson got the chance to meet and see the talent of goal keepers here on the island. Furthermore, Jamieson will be conducting another goal keeping workshop for the senior goal keepers, 16 years of age and older, next week.